The two tracks on this 7-inch single represent the first new work from Sion Orgon, following on from his album The Zsigmondy Experience in 2008, and mark the last collaborations he made with the late Peter Christopherson of Coil, SoiSong and Throbbing Gristle. Sleazy features on both sides of this single supplying manipulations, atmospheres and field recordings while fellow Welsh musicians Thighpaulsandra and Seb Goldfinch contribute to 'Into The Dark'. compulsiononline readers may have picked up on our review of Sion Orgon's last album, The Zsigmondy Experience - a stunning album encompassing experimental electronics, prog rock, post-rock with almost pop-like melodies, which featured all the aforementioned musicians. This single is cut from similar cloth. Worming its way from atmo-electronics and location recordings, 'Into The Dark' meanders a little to the blur of vintage electronics before it opens up with Orgon's gentle voice set against sustained violin strings just as it swells into an almost guitarless post-rock sound, with blurry arching electronics shadowing Orgon's melodic tones. It's fantastic inventive stuff - like a stripped back version of 'I'm In Black Out' from The Zsigmondy Experience. On the flip side, Orgon showcases his more abstract work with sombre airy piano notes oozing a melancholic atmosphere over manipulated treatments and subtle bass tones. 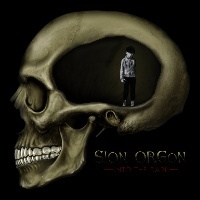 Like 'Into The Dark', it's all wonderfully controlled and ample evidence of Orgon's ability to make experimental sounds palatable and necessary.